MOSCOW, October 3. /TASS/. 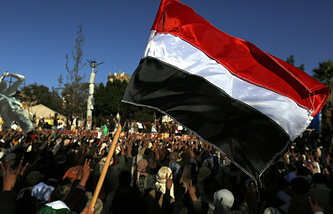 The road to peace in Yemen lies through a wide national dialogue and Russia will be prepared to promote a settlement of the conflict in that country, if need be, Russian President Vladimir Putin said at a credentials presentation ceremony attended by newly-appointed foreign ambassadors in Russia, including Yemen’s Ahmed Salem al-Wahishi. "We are certain that the road to peace and accord [in Yemen] lies through a wide national dialogue accommodating the opinion of all political forces. We will be prepared to promote the settlement process by all possible means, if need be," Putin said. Yemen has been a scene of armed confrontation between government forces and Houthi rebels since August 2014. The hostilities peaked with the intrusion of the Saudi Arabia-led coalition in March 2015. The United Nations has repeatedly voiced alarm over the looming disaster: according to the latest estimates about 20 million Yemenis - about 70% of the country’s population - need humanitarian assistance and the number of internally displaced persons has exceeded three million. Seven million people are on the brink of famine and two million children suffer from acute malnutrition.